Early morning pick up from your hotel then transfer to Hurghada airport and fly to Cairo. 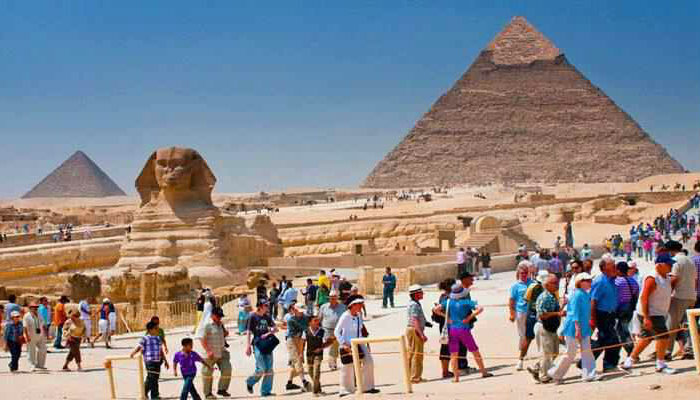 Meet in Cairo airport then transfer to Giza plateau at the outskirt of Cairo to wander Giza three large pyramids of Cheops, Chefren, Mykrenious, Sphinx and the Valley temple attached to the pyramidal complex of king Chefren. Continue to the Egyptian Museum of antiquities to stroll both Egypt modern and ancient art pieces all in one place, it hosts about 120,000 antiques on display and many others are kept in the store room, you will admire 2 floors of exhibited items including Tutankamon priceless collection, library and Mummies Room. End the tour with free time strolling the oldest local market in Egypt and Middle East, stop in Khan El Khalili bazaar to experience the most of Old Cairo popular attraction before transfer to Cairo airport, fly to Hurghada and transfer to your hotel.